WASHINGTON — Companies competing to build hundreds of broadband satellites for Canadian fleet operator Telesat are considering setting up production facilities in Canada. European manufacturer Airbus Defence and Space and a consortium led by U.S.-based Maxar Technologies and Thales Alenia Space of France and Italy both see the Telesat LEO contract as a $3 billion opportunity. All three companies have a presence in Canada, though their headquarters are located elsewhere. Airbus and the Maxar-Thales Alenia Space consortium separately announced completion of the systems requirements review for Telesat LEO in January, paving the way for Telesat to select a winner later this year. Telesat has asked the potential manufacturers to come up with not just satellite designs, but an end-to-end system that shows how the ground segment — teleports and user terminals — will function with the spacecraft. 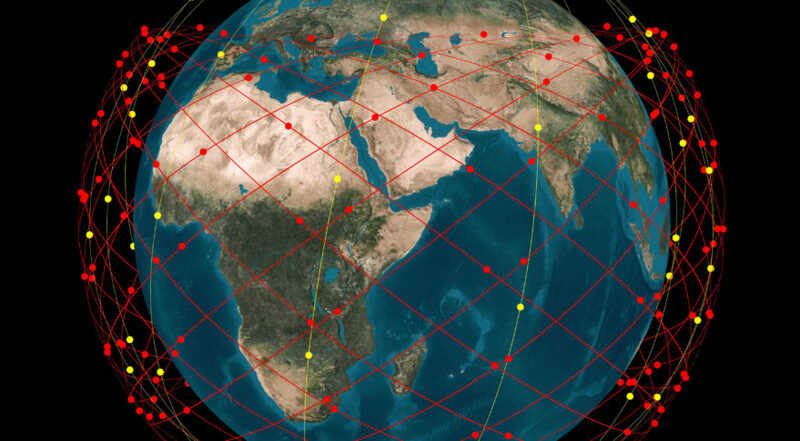 Telesat ultimately wants a constellation of 292 satellites, though it hasn’t said how many a manufacturer would build under an initial contract. The U.S. Federal Communications Commission approved a 117-satellite Ka-band system for Telesat in 2017 and another 117 satellites in 2018 for the rarely used V-band. “The consortium is considering several options for the localization of the required last generation production facility, with strong options in Canada if it were selected by Telesat, supporting the Canadian strategy to be a leader in space in a very competitive international environment,” Martin Van Schaik, executive vice president of sales and marketing at Thales Alenia Space, said by email. Non-geosynchronous constellations of small telecom satellites have attracted greater interest from spacecraft manufacturers as orders or traditional geostationary satellites dropped precipitously the past few years. Telesat LEO contenders are touting their experience with other constellations as they vie for the Telesat contract. Van Schaik said Thales Alenia Space can leverage its recently finished work building 81 low-Earth-orbit communications satellites for Iridium, as well as its experience building 20 medium-Earth orbit satellites for SES’s O3b system. Dario Zamarian, group president of Maxar company Space Systems Loral, said by email that MDA Corp., another Maxar company, collaborated with Thales Alenia Space on the Iridium and O3b systems, but didn’t go into specifics. In July, Maxar’s then-CEO Howard Lance said Maxar would focus on the satellite bus, propulsion, antennas and other spacecraft electronics, while Thales Alenia Space would bring expertise in systems engineering and digital payloads. Chamussy said Airbus can capitalize especially on its experience with OneWeb, for which it is building 600 to 900 satellites, through a Florida-based joint venture with OneWeb called OneWeb Satellites. With OneWeb, Airbus learned where it can apply robots, what components to build in-house, and which to outsource, he said. “We know what can be done and what cannot be done,” he said. The cost per OneWeb satellite grew to “around $1 million,” he said, which is higher than the $500,000 target set at the program’s outset, but includes additional performance. The better-than-expected capability of the satellites, as demonstrated through ground testing, has OneWeb considering a first generation fleet of 600 satellites instead of 900. The first six OneWeb satellites are set to launch later this month on an Arianespace Soyuz from French Guiana.